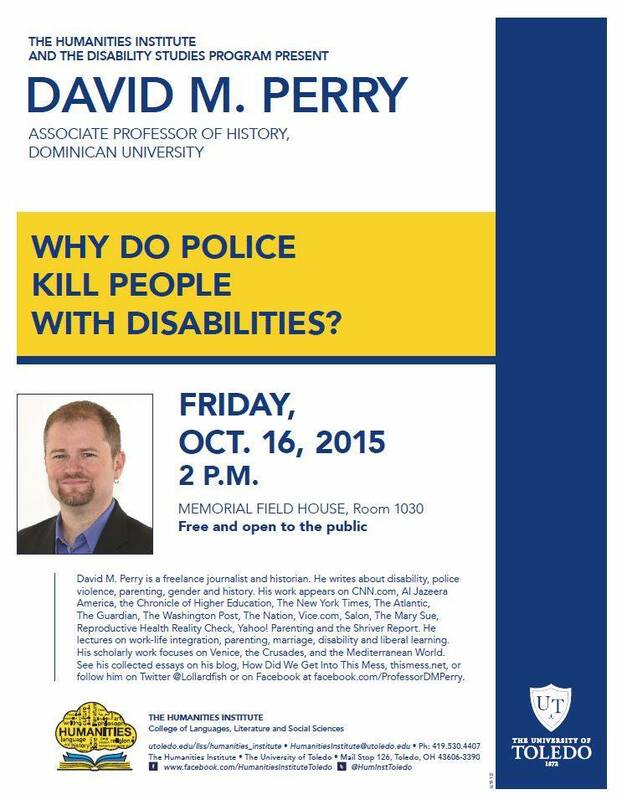 I am very excited to be going to the University of Toledo tomorrow to offer a talk: Why do police kill people with disabilities? Are you in the area? 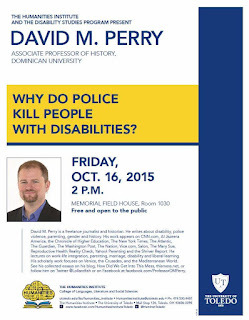 It's a public lecture this Friday, 10/16. Details: Memorial Field House, Room 1030, 2:00. Description: A third to a half of all people killed by police have disabilities, but the word "disability" almost never appears in the reporting or policy discussions around police use of force. Instead, we talk about mental illness or ignore the issue altogether. In this talk, journalist and historian David Perry argues that this silence not only leaves people with disabilities at risk of violence, but makes it harder for us to enact effective reforms. I will also be offering Toledo faculty (pre-registration only, now full) my public writing workshop for academics: Go Public. This half-day workshop focuses on both the conceptual and pragmatic aspects of adapting academic expertise for the public. Are you at a university? You could bring me to give a talk and/or a workshop too! I hope to talk to lots of people as I work on my book: Disability Is Not A Crime.